When Larry Hogan walked out of his office door at exactly 10 a.m. Wednesday into his reception room full of people awaiting his arrival, it was one of the many firsts for the new governor in his first week. 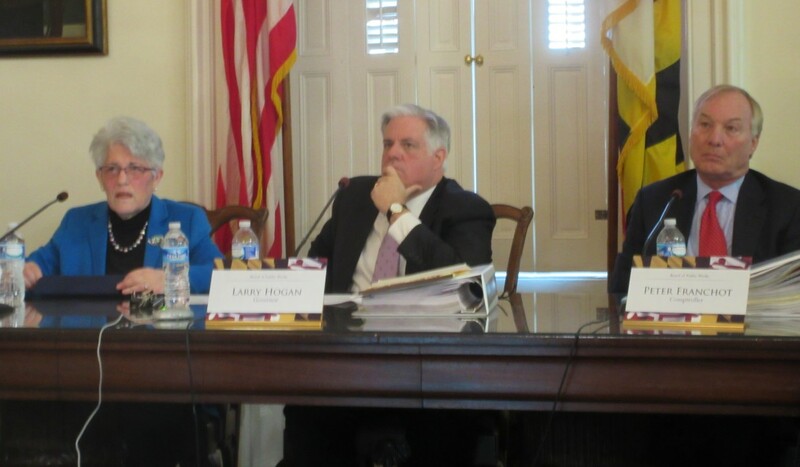 “This is the first time in 12 years that the Board of Public Works has started on time,” Hogan declared. His predecessors Martin O’Malley and Bob Ehrlich were notoriously late by 15 or 20 minutes or more for the meeting of the powerful board that approves billions in state contracts every year. The session itself was another first for Hogan. He said he had never attended one of the meetings of the board that generally meets twice a month on Wednesdays throughout the year. “I’ve still got my training wheels on,” Hogan joked. He was clearly very tentative about procedure, but he soon figured out that he could run the show pretty much the way he wants — as long as Franchot or the State Treasurer Nancy Kopp, the other two board members — go along. Hogan also made a largely symbolic rejection of an item on the agenda to send a message to state agencies. He rejected a report of a $40,000 contract for providing consulting services and assisting with public relations and communications in response to the influx of unaccompanied alien children from Central America last July. Hogan’s objection was this was emergency procurement that had already happened and the money paid out. “I think an emergency should be an emergency,” Hogan said, and Franchot concurred over what had been one of his pet peeves — agencies asking for retroactive approval for contracts already done. The Department of Human Resources blamed “extended sick leave and vacancies of key personnel” for the delay. A video about the school construction portion of the meeting and Hogan’s focus on school maintenance is below this story. Hogan told MarylandReporter.com that he had not yet started work on his State of the State address he will give next Wednesday.